by Robert J. Doman Jr. It appears that middle ear fluid (otitis media with effusion) is a significant problem for children with Down syndrome. Our experience at NACD with literally thousands of children with Down syndrome indicates that middle ear fluid issues are ubiquitous and are of tremendous concern relative to the global development in this population. For forty years NACD at any given time is working with approximately 300 children and adults with Down syndrome from all over the world. We work with the “whole” individual and look for correlations between issues to determine how to best address problems and global development. One of the ongoing issues affecting overall medical care and therapeutic intervention, particularly as is it impacts children with developmental issues and complex interdependent issues, is the compartmentalization of the care. At NACD we are acuity aware of the importance of working with the “whole” child. Looking at isolated pieces can lead to ongoing issues that can have very significant impact on the child’s development and could possibly be remediated if the need were perceived based on the totality of the impact. When looking at the “whole” child, it is possible to identify discrepancies in development. 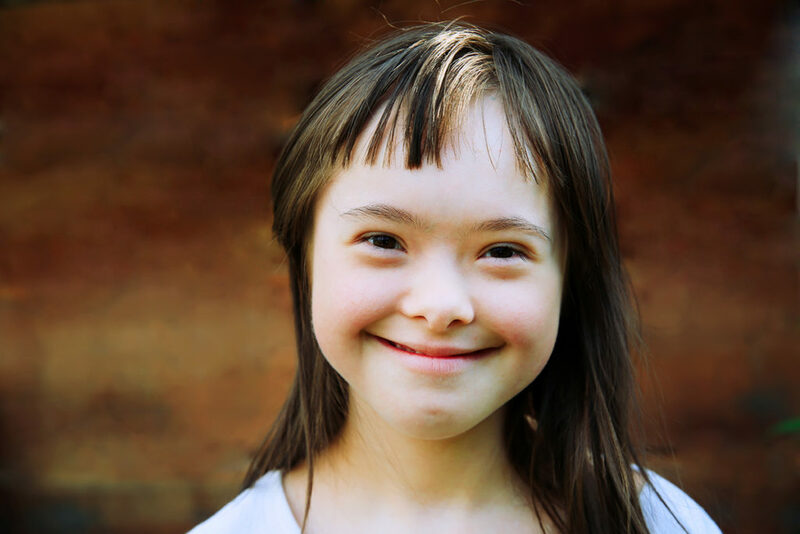 Development in children with Down syndrome typically follows “normal” development. This development, albeit slower than normal, follows the same patterns and exhibits the same associated developmental pieces as ‘typical” children. In areas where there are inconsistencies in the development of associated pieces, it is necessary to identify underlying cause. Often when language is delayed more than other areas, the underlying cause is something that is adversely affecting the hearing. When dealing with a problem such as middle ear fluid, we want to address cause when possible. Mucus and congestion are virtually synonymous with middle ear fluid. It would appear that we could avoid at least part of the fluid problem by more aggressively addressing the cause of mucus. Many children have allergies that can be treated, but mucus-producing foods are in most every child’s diet. It would appear that if we could eliminate dairy and gluten from our children’s diets, we would probably go a long way toward avoiding or mitigating these issues. Children with DS have anatomical issues that increase the prevalence of middle ear fluid. These issues include large adenoids, small nasopharynx, impaired swallowing, and narrow and abnormally horizontal Eustachian tubes. These anatomical issues, coupled with the fact that children with DS tend to have excessive mucus and excessive earwax, further complicates the problem. Middle ear fluid issues often resolve themselves in typical children; but the anatomical issues associated with DS make this substantially more difficult. One of the issues that appears to create problems for children with DS is that middle ear fluid, even if considered in the “normal” range based on tympanic testing, can still have a significant impact on the hearing and development of this population. Over the course of decades, we have seen numerous cases where at parents’ insistence tubes were inserted even though tympanograms indicated that fluid was still within “normal” ranges.1 Following many of these procedures the doctors commented after the procedure that there was much more fluid than expected. It appears that for the majority of children with DS having received tubes, even when the need based on the exams and testing was questionable, there were virtually immediate positive changes in language development. I leave it to the ENTs (otolaryngologists) to research and determine if different testing, norms, or criteria are needed. This is clearly an area requiring further investigation. Complicating the issue as to whether or not to place tubes is the issue of what level of baseline testing is needed. Often children will have a flat tympanograms, and the doctor’s recommendation is to wait two, four, or even six months to repeat the testing. For a child, particularly a child with delayed language and cognitive development, two months or more can have tremendous impact on the child’s future development. If the doctor wishes to be cautious, repeat the tympanogram in two weeks. One might also consider the child with chronic congestion who will have some degree of associated chronic middle ear fluid. Why not in such cases insert tubes to assist with the mechanics and help drain the fluid? When this issue is seen relative to its global impact on the development of the child with DS, I believe aggressive treatment can be justified. Tubes would appear to be a relatively simple, inexpensive, benign treatment that can have significant, if not dramatic, impact on a child’s development and future. To understand the significance of this issue, let’s look at developmental issues that can result from perhaps even a moderate issue with middle ear fluid. Hearing involves sound waves moving into and through the outer ear and impacting the eardrum. 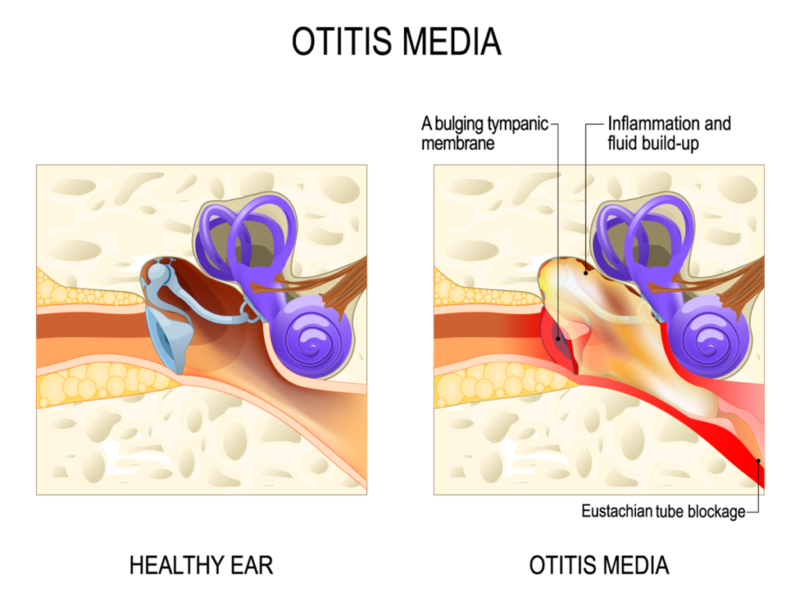 The sound waves vibrate the eardrum, which in turn produces movement of the three small bones of the middle ear. The middle ear is a cavity containing air that should have the same atmospheric pressure as that outside the body. The pressure is regulated by the Eustachian tubes, which go from the middle ear to the upper part of the throat. The sound waves then produce vibrations on the oval window that then transmits the vibrations to the fluid in the inner ear, which in turn stimulates the hair cells of the cochlea, transforming the vibrations into nerve impulses that enter the acoustic nerve and then the brain. It is the brain that actually interprets the information and “hears” the sounds or words. One of the immediate issues with middle ear fluid is resulting hearing loss. Numerous studies have equated hearing loss in DS to middle ear fluid. 2,3 Conductive hearing loss, which is common in DS, is usually caused by middle ear fluid, but can also be caused by excessive wax. Receptive language refers to the ability to understand language. Every child begins learning to understand language by hearing specific words in association with specific objects or events with sufficient frequency, intensity, and duration. The consistency of this input is imperative for the child to literally learn to hear and understand. A completely deaf child receives none of this auditory input; a child with a hearing loss receives poor input; and a child with inconsistent input resulting from variations in middle ear fluid receives often less than the necessary quality of input needed for receptive language development. Receptive language is the first step in the development of expressive language, speech, and cognition. Expressive language/talking has been historically one of the biggest concerns for children with DS. Sometimes those not understanding the foundational issues will out of vexation resort to sign language or augmentative communication to facilitate communication and avoid frustration. Lack of function should not be perceived as a lack of potential or inherent ability to develop that function. If a child with DS is not talking, there is a reason that needs to be identified and addressed. Rarely do children with DS have oral motor issues or apraxia to such a degree that it prohibits the development of basic language, even though such issues can affect the speech. Significant delay in the development of language in a child with DS is virtually always a reflection of an issue with hearing or inconsistent hearing. Developmentally we refer to speech/articulation as the production and clarity of speech. A significant component of speech is oral motor function, which is a very common issue with children with DS. However, you cannot reproduce what you cannot hear. Middle ear fluid issues can produce issues with learning to process specific frequencies of sound. If you cannot hear, or if your brain does not learn to hear, a specific frequency, then it can’t be reproduced. Case in point, there is not an “r” sound in Japanese, and even for a native Japanese speaker who becomes fluent in English, the “r” sound may be next to impossible to learn because when their brains were learning to hear, the opportunity to hear that sound did not exist. Repeating the word “rice” typically comes out as “lice,” regardless of the number of times they hear the word spoken correctly. Audiograms, which only measure typically six frequencies, do not identity very specific frequency issues. We have used voice analysis to gain a better understanding of specific frequency issues and have discovered that they are extremely common. I would like to see research directed at seeing whether voice analysis could be used to accurately assess hearing more specifically and objectively than an audiogram or in conjunction with and audiogram. Language and the development of language is primarily a reflection of the development of auditory sequential processing. Expressive language will not exceed the ability to sequentially process, hold, and mentally manipulate auditory information. Auditory sequential processing/short term memory is measured in pieces of auditory information that can be processed in a sequence or chain. This is often tested and measured by how many numbers you can hear presented in a sequence at one-second intervals. It could also be measure by the ability to listen to and repeat random words also heard at one-second intervals and repeated or how many simple directions one can hear in a sequence and then carry out. Generally, a child who can follow one simple direction will use random isolated words, working into functional use of individual words. As the child moves into being able to follow two-step directions, they will begin using two and then three-word phrases. When they can sequence three pieces, they will start using four, then five words in a sentence. As their auditory sequential processing increases, so does their receptive and expressive language. The foundation of working memory, which is now appropriately being called the new IQ, is built upon the short-term memory. Working memory essentially represents complexity of thought and is reflected in global maturity and executive function. All of this put together represents cognition, which is simply that which permits us to learn, think, and communicate. Issues affecting hearing in the first few years can have a negative impact on the development of all of these critical pieces, an impact that may not be able to be entirely remediated, or which requires years of extensive specific targeted intervention. Over six million children have been diagnosed with the mysterious “disease” of ADHD, which is termed as a mental disorder, rather than a developmental disorder. Perhaps this delineation is based on a perception that a mental disorder can be treated with drugs, as opposed to a developmental issue that cannot. I believe that one of the most common issues affecting attention is auditory sequential processing and that one of the primary causes of auditory processing issues is recurrent middle ear fluid in children. The inconsistencies in hearing adversely affect the child’s ability to attend to and process language, resulting in slow or underdeveloped auditory development, including auditory sequential processing. Negatively impact auditory processing and you subsequently negatively impact auditory short-term memory, auditory working memory, executive function, and global maturity. The term ADHD is at times used as a secondary or dual diagnosis for those with Down syndrome and other developmental problems, but the symptoms that result in this label exist in every child with a developmental cognitive delay. It is questionable at the very least to ignore the cause or causes and needed developmental intervention by attempting to mask the symptoms with medication. Learning to read can be very negatively impacted by even minor hearing or specific auditory tonal processing issues. Teaching reading using an auditory tonal and auditory sequential processing approach, such as phonics, is often disastrous for those with Down syndrome because of their auditory issues. However, children taught reading through a more visually based sight word approach do much better. A visually weighted word attack approach still has a significant auditory component. Issues with auditory tonal and sequential processing have a negative impact regardless of the reading approach, but significantly less of an effect with a sight-reading foundation. The vestibular system plays a significant role in the development of ocular control, tracking, and the development and severity of strabismus. The vestibular system as mentioned previously affects the movement and control of the extraocular muscles that are responsible for visual tracking and which need to work in concert to keep the two eyes working together. It is not unusual to see children with DS suddenly develop a strabismus or to see it suddenly get worse.6 When we become aware of these issues, we suggest that the family visit their ENT first, not their optometrist or ophthalmologist, because the most likely cause of the issue is middle ear fluid. Strabismus, which is a misalignment of the eyes, can take many forms, but generally the family will observe one eye or the other going in toward the nose or out toward the ear. If a strabismus exists the child is unable to perfectly align the eyes together, with a resulting loss of depth perception. It would appear that even slight issues with middle ear fluid could have a negative impact on ocular control and a negative impact on a wide range of functions. Seen in isolation some degree of middle ear fluid may not appear to be of great significance. However, in viewing the global aspects of middle ear fluid we have an issue that can have wide ranging and significant impact on a child’s future development. We urge parents and professional to be vigilant and to address ear fluid aggressively. Remediation of issues associated with middle ear fluid generally requires targeted, vigorous, dynamic, and coordinated intervention. Int J Pediatr Otorhinolaryngol. 2013 Aug;77(8):1329-32. doi: 10.1016/j.ijporl.2013.05.027. Epub 2013 Jun 20. In this study one in three eight-year-old children with DS had current middle ear fluid and had verified hearing loss.